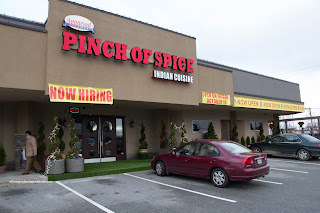 Rising from the ashes of the North Delta location of Sammy J Peppers comes another Indian Restaurant. 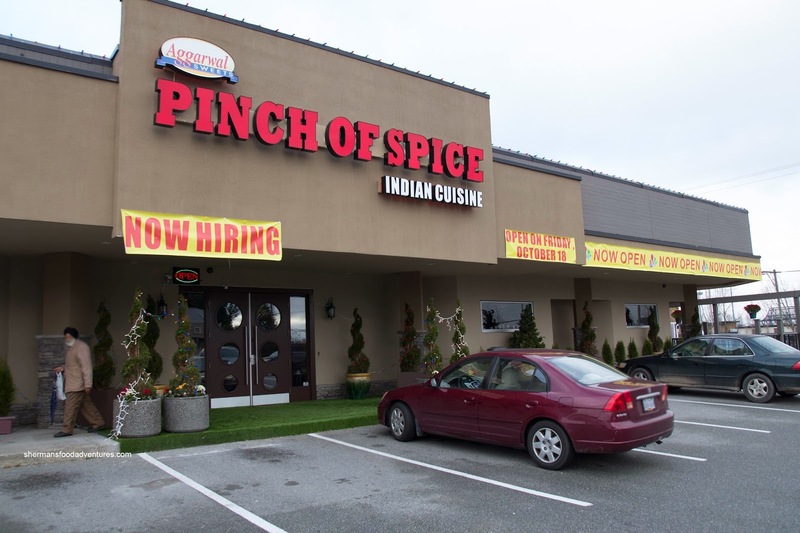 Like Richmond needs more Chinese restaurants and luxury SUVs, Pinch of Spice joins a roster full of Indian restaurants along Scott Road. To be fair, not many of them sport trendy decor and ambiance, except for Tasty Bistro down a few blocks. Now flash and dash is one thing, the question is the food any good? Joining me to see for ourselves was Mr. Talkative. Hitting the table first was a complimentary basket of Papadums with cilantro chutney. These were crispy and when dipped into the chutney, we were treated to a cool brightness. 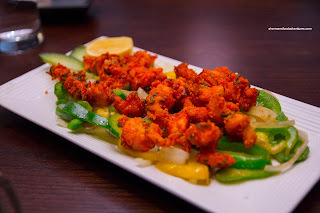 For our first dish, we had the Crispy Prawn which was not served with a sweet chili sauce as described on the menu. 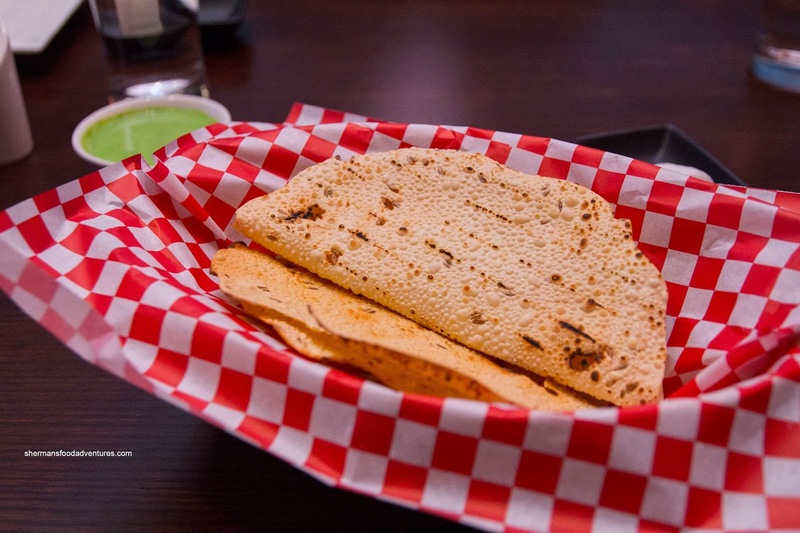 Whatever, we dipped it into the cilantro chutney instead. Each piece was pretty crunchy and plenty flavourful with a pinch of spice (ironic I know...). However, they were fried too long as the meat was rubbery and chewy. 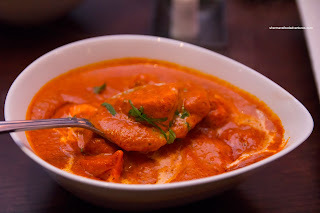 Naturally, we had to try the Butter Chicken and it was pretty good. This version rode the fine balance between tomatoey and creamy. There was no denying the richness of the dish, yet there was just enough tomato paste in there to provide a counterbalance of tartness. The default spice level was mild while not being completely wimpy either. Although the chicken was sufficiently moist, it could've been more so. Next, the Lamb Curry was pretty rich and full of depth. With a nice consistency and noticeable spice (still mild though), there was no absence of punch. The chunks of lamb were super moist. 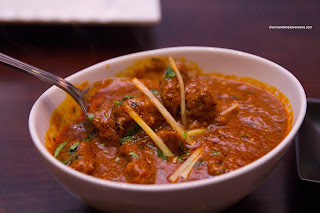 Lastly, we had the Mutton Rogan Josh (even though it was in the goat section) and this was probably our favourite. 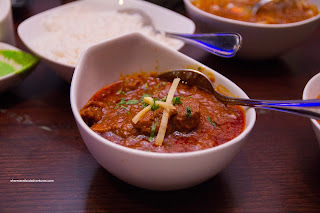 There was a good hit of spice including ginger and onions. It was also quite rich and fatty. As for the Naan, they were chewy and had a good elasticity while the underside was crispy and blistering. 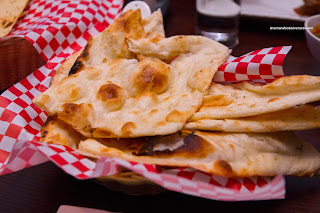 In reference to the accompanying picture, the Naan was pretty decent as it was blistered and plenty crispy on the bottom while soft and chewy inside. As much as the service was pretty green, the food was more than acceptable. Pinch of Spice offers up credible competition to the trendy Tasty Bistro up the street.